Cowboys and Christmas, a yummy combination. This first book in the Cold River Ranch series features Gray and Abby, and is full of romance, family, and of course, plenty of angst. Abby has loved Gray for a lifetime, but it might not be enough to tear down Gray's walls. The story does have its dark side, but it's also full of wonderful characters and despite their differences, this pair is perfectly suited. The writing style and wonderfully vivid scenes keep the pages turning for a hard to put down story. 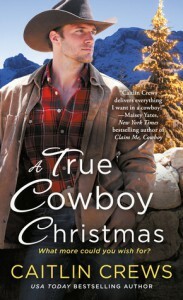 I would've liked to have seen more holiday in the book, especially with Christmas in the title, but all in all, A True Cowboy Christmas is a great start to the series.